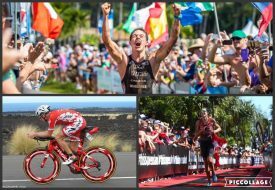 (Boulder, CO) Mauricio Mendez winning the XTERRA World Championship, Heather Wurtele’s reign as the IRONMAN 70.3 North American Champion, and Ben Hoffman’s multi-media partnership with TransAmerica are among the highlights in A Year of Work and Reward(s): Professional Triathlon in 2016, a summary of the accomplishments of the Human Interest Group (HIG) athlete clients. “Thank you to our athlete clients, fans, sponsors, industry peers, and friends who made this a phenomenal year in triathlon,” says HIG Managing Director Franko Vatterott. HIG is a leading sports management and influencer marketing company. Day after day in 2016, the Human Interest Group (HIG) stable of athletes enthused fans and engaged with sponsors through their hard work, professionalism, and an inspirational attitude. HIG added IRONMAN 70.3 rising stars Jake Montgomery and Lauren Barnett to its international roster of road and off-road triathletes. New partnerships with leading companies were created and existing relationships sustained through the year. “Stand-out performances and down-to-earth personalities of our clients extended the reach of sponsors and their brands this year. Craig Alexander inked a lifetime contract with Newton Running, Ben Hoffman helped develop a creative partnership with Transamerica, Team Wurtele’s Heather and Trevor signed on with Louis Garneau, while Tim Don, Rachel Joyce, and Paul Barny continued their work with Team Bravo,” says Human Interest Group Director Michael Cardoza. A Year of Work and Reward(s): Professional Triathlon in 2016 can be found on the Professional Triathlon website. Mauricio Mendez: 2016 XTERRA World Champion, 1st at XTERRA Denmark, Sweden, and Italy; 1st at IRONMAN 70.3 Los Cabos and Cozumel. Heather Wurtele: 2016 IRONMAN 70.3 North American Champion; 1st at IRONMAN 70.3 Victoria, Monterrey, and California, and Challenge Iceland; and 3rd at IRONMAN 70.3 World Championship. Lesley Paterson: 2nd at XTERRA World Championship, 1st at XTERRA Italy, France and Laguna Beach. Tim Don: 2016 IRONMAN 70.3 South American Champion and 1st at IRONMAN 70.3 Monterrey. Ben Hoffman: Top American at 2016 IRONMAN World Championship, Kona-Maui Double title (fastest combined time at IRONMAN and XTERRA World Championships), and 2016 IRONMAN African Champion. Radka Vodičková: 1st at IRONMAN 70.3 Hefei and Putrajaya. Craig “Crowie” Alexander: 1st at IRONMAN 70.3 Busselton (setting a new course record), Putrajaya, and Subic Bay. Samuel “App0” Appleton: 1st at IRONMAN 70.3 Argentina, 2nd at IRONMAN 70.3 Chattanooga, and 3rd at IRONMAN 70.3 Boulder and Bahrain. Jake Montgomery: 1st at IRONMAN 70.3 Geelong. Lauren Barnett: 1st at IRONMAN 70.3 Racine and Raleigh. Rachel Joyce: 2nd at IRONMAN 70.3 Pucón. Trevor Wurtele: 2nd at IRONMAN 70.3 Victoria, Mont-Tremblant, and Monterrey; 3rd at IRONMAN Canada. Paul “Barny” Matthews: 4th at IRONMAN Brazil and IRONMAN Mont-Tremblant. Visit www.professionaltriathlon.com for latest athlete bios and updated race reports.